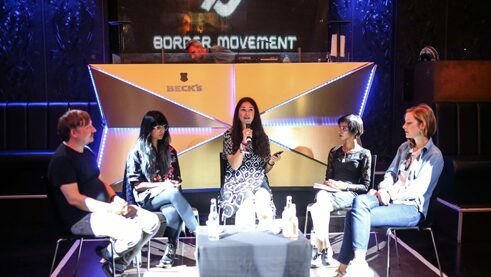 Natasha Ejaz is one of three South Asian musicians participating in this years "Border Movement residency". The residency program, which is supported by the Goethe-Institut, gives the musicians the opportunity to come to Berlin for three months. 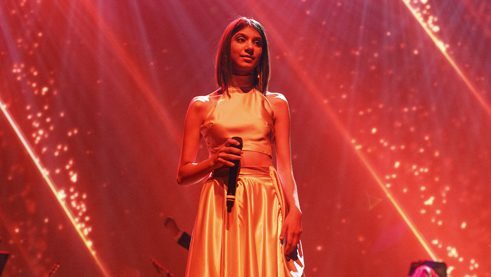 Natasha Ejaz is living in the Holzmarkt and performed at the Pop-Kultur festival in Berlin. Ms. Ejaz, could you describe your life as a musician in Karachi? What's the music scene like over there? I do a mix of performance, education and production. So far, I have released a number of singles and one EP under my own name and several singles through my project "Stupid Happiness Theory". I love being who I am in Pakistan, but I am a little on the outside. Even my personal stuff, before "Stupid Happiness Theory", has never been mainstream. But I enjoy fantastic audiences back in Pakistan. I am constantly performing and I have a very steady fanbase. What have you been doing during the residency in Berlin? It has been a mix of recording in the studio and being open to sonic information. It is interesting to walk through Berlin and listen to the sounds. The city provides you with a space you can tap into later. I record it and use it for my tracks. One of the tracks I played at the Pop-Kultur festival was recorded in Berlin. When I came here, it was the week of the FIFA World Cup final. There was an uproar at the Holzmarkt in Berlin when France won. There were hundreds of people there. I went around with my portable recorder and took samples of people singing and dancing and used these field recordings. Furthermore, I go out to concerts. I crave live performances. This is the first time I started going out to clubs and I'm enjoying this new space and the interesting human interactions. "We were the MTV generation"
I get inspiration from artists like Jeff Buckley or Fiona Apple. But my influences have been shaped equally by Pakistani and Western sounds. I don’t really like the assumption that just because I'm Pakistani I should be playing Raga. Raga will influence my music inadvertently, because I listen to it. But why does it have to be so much "in your face"? I was born in 1988 and I lived through a very interesting time in Pakisten, just when the internet was just introduced. We were the MTV generation. I'm singing since I'm three years old. In my household there were a lot of Pakistani and Indian musical influences. We don’t have a club culture in Pakistan but we have a concert culture. A lot of people think there is no place for Western contemporary music in Pakistan but I am the living example for it. Do you ever consider leaving Pakistan and moving to the West? No, I love living in Pakistan, I don’t want to move. I’m not one of those artists who run away. Most people in Germany don’t have any idea about Pakistan. In general, Europeans are happier because of the freedom they have been able to achieve in the last couple of decades. But that doesn't mean that there is no instability here. I'm learning that the West in as unstable as Pakistan in some ways, concerning the immigration laws for example. Since I've come, I have also found out about the strong right-wing movement throughout Europe. What do you think of the current political situation in Pakistan? Pakistan has gone through a major goverment change recently. But anything happening in Pakistan becomes a bigger issue than it actually is, because it is a Muslim country. I’m not saying that Pakistan doesn’t have its problems. We had a dictatorship for decades and now we have a democracy. Things are looking better for Pakistan than ever before. Our former prime minister is in jail. For the first time in my life a politician has been held accountable due to corruption. That's incredible.